To determine the price of repair, NASH uses a flat rate based on accepted industry standards. Regardless of how long a repair takes, we only charge the amount designated for that particular task. NASH employees are professional, clean, uniformed and ready to solve your A/C problems. NASH is available 7 days a week. We have technicians ready for you in an emergency. NASH technicians are certfied and trained not only in technical aspects of work, but also in customer relations. NASH always gives you a courtesy call to let you know we are on our way. If for some reason we cannot be on-time you will be notified. 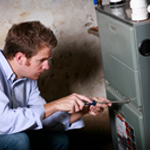 NASH offers a Service Call Credit toward installation. If you need a total replacement of a unit, the costs of the initial service call will be applied to the cost of a new installation.